Transition saddles, also known as floor thresholds, provide for easy access when moving across a junction between two different floor surfaces. These strips are usually made from natural stone. Marble is the most popular stone material used for thresholds because it helps create a primary or secondary accent, one that complements other marble features used in the design of the room’s interior. As you may imagine, the fact that these pieces are so versatile has ensured that engineers have come up with many different ways to install them. If you were to browse through blueprints and CAD documents, then you’d find dozens of different size specifications and linear dimensions. Fortunately, there are several popular sizes you’re more likely to see than any others. This has to do with where they’re most often installed. Thresholds are commonly placed in a doorway. For example, if a bedroom is covered in carpet, a threshold strip can be placed in the doorway to a bathroom that is surfaced with marble tile. The threshold acts as an effective water barrier and also smooths out the junction between carpet and tile. Stonexchange is a manufacturer, importer, and distributor of marble stone threshold strips. Our company maintains a huge inventory of all the popular sizes and styles of marble used in the industry. We offer our clients the opportunity to purchase standard and non-standard size thresholds in bulk supply, and our wholesale prices are the lowest available. In the United States, the standard size doorframe is 36 inches. The threshold placed on the floor of the doorway must be this wide in order for the stone to meet up with the lower level of the doorframe. The saddle must also be thin enough to set properly on the subfloor, with only the beveled surface raised above the level of the carpet or tile. A marble threshold is manufactured from a sheet of stone. The sheet is thinned down to approximately 5/8-inch in thickness, and the strips are cut into 36-inch lengths. A bevel is cut along one or both long sides, and the strip is then polished to give it a lasting shine. The width of the saddle can vary depending on the style of the doorway in which it is placed. Many residential interiors have rather narrow door frames, meaning that an even narrower saddle will be used. Some commercial buildings have doorways with wider frames, and saddles up to 10-inch widths are used. In some cases, the elevation of one floor is higher than that of the other. This is often the case in older buildings undergoing renovation. Depending on the type of flooring surface chosen during the upgrade, this discontinuity in height may remain. A standard single-bevel threshold that is slightly thicker is often used in this situation. The result is a small ramp effect that is low enough so as not to be a tripping hazard. Wheelchairs can also pass over the saddle without difficulty. When properly installed, a marble threshold sits at a level that makes it safe for traffic passage while at the same time adding a distinctly beautiful accent to the room interior. All of the marble thresholds manufactured by Stonexchange comply with building codes. The ADA stipulates that all transition saddles installed in the United States must be placed at a level below that of the floor surface. The threshold is installed on a bed of mortar that is spread upon the subfloor. Only the beveled top of the saddle is at or above the level of the tile, carpet, or hardwood. Remember that Canadian and overseas architects will often write out their dimensions in metric even if they plan to put up a building in the United States. While this might seem confusing, the sizes are often the same as those used by American designers. Convert the units and then have a look through our catalog. For instance, you might be confused when you see someone asking for a 91.44 cm. piece of material out of nowhere, but that’s actually the same thing as 36 inches. It’s merely a different way of expressing the same number. Thresholds are manufactured with a beveled edge along one or both of the long sides. Standard single-bevel thresholds are usually manufactured in 36-inch lengths and have a slight, 1/4-inch bevel along one long side. The other long side is merely smoothed and rounded. Hollywood bevel thresholds have a longer bevel, usually about 1 3/8 inches in width. These saddles are often used in commercial buildings such as hospitals, public use facilities such as post offices and recreation centers, and in upscale resort complexes. Single Hollywood bevel thresholds have this wide bevel along one of the long sides. Double Hollywood bevel thresholds have a matching bevel on the opposite side. Hollywood bevel thresholds are usually wider than the standard single-bevel saddles described above. This is because the doorframes where these pieces are used are often wider than average. Single Hollywood bevel saddles are also used as perimeter pieces for a raised marble floor. The threshold strips are placed next to the baseboard with the beveled edge on the outside. At Stonexchange, our mission is to provide commercial clients with premium quality thresholds at wholesale prices. We save our customers money because we deliver product in full-crate quantities. Most of our customers are construction contractors or flooring product retailers that supply these installers with natural stone building materials. We produce, import, and distribute all of the popular color shades and styles. Most building plans call for a specific color tone, and the marble used to accent the room’s interior must satisfactorily match what the designer or architect has in mind. The most popular colors of marble used for thresholds, flooring tiles, and matching windowsills are cream/beige and off-white. Our Crema Sahara Marfil marble thresholds are a medium beige tone with moderate vein patterning. This tone is similar to Botticcino and blends well with other neutral room shades. It also complements darker shades of wood furniture and has medium reflectivity. Nuevo White Carrara is Stonexchange’s off-white marble shade threshold. This color is very popular for use in commercial interiors where a stately appearance is desired. Its light tone and gray streaks give a room the look of strength and longevity. This tone is similar to Alabama White, Georgia White, and Vermont White marble. 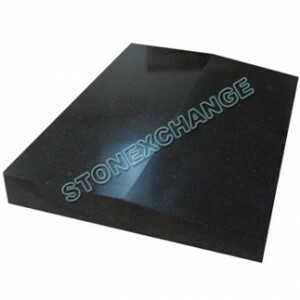 Absolute Black Granite is a natural granite stone that is very similar to China or Black Galaxy granite. This is a beautiful stone material with very little pattern markings. Our company produces dark granite thresholds in all of the standard styles and widths. All of the threshold styles and sizes mentioned here are available in full-crate orders from Stonexchange. Our company imports huge container loads of product on a monthly basis, and all of our products are manufactured at overseas fabrication centers that we own. We produce our finished products at a cost that is far below the industry average, and we pass these savings along to our commercial clients. All orders for marble thresholds must meet a minimum piece requirement. Most of our larger, wider floor saddles are packed in 100-piece quantities, and some of the smaller, narrower saddle strips are available in quantities of at least 200 pieces. Our distribution center in Florida holds sufficient inventory for merchants or contractors to order several thousand pieces with little or no delay in processing and delivery of the product. We use overland freight companies to ship our thresholds. The pieces are contained in stackable shipping crates that have pallet-style bases. This makes for easy loading and unloading of product. In most cases, customers will receive their order with a damage count of less than five percent. Large orders for several crates of material may have to be shipped directly from our fabrication center. Stonexchange does not charge extra fees for this overseas delivery method, nor do we charge a fee for non-standard size material requests. We can manufacture thicker or wider thresholds if the customer desires, but please keep in mind that these orders involve 8-10 weeks lead time. Orders for custom-sized thresholds must still meet our minimum piece requirement. Our company representatives can give merchants or building contractors an accurate price estimate at the time a custom order is placed. Because we import on a regular schedule, our fabrication centers are always producing material, meaning we can accommodate custom orders at any time of the year. Keep in mind that retailers and larger wholesale organizations will need to have a multitude of different sizes on hand at any given time. You’ll have to be sure you’ll have what people are looking for when contractors get on the phone, so it’s useful to order many different sizes to maintain your stock. This also means you’ll want to have a collection of various materials and colors on hand, just in case a major order comes in overnight. Of course, you shouldn’t neglect diversity of both dimensions and material types if you’re a home improvement firm or contracting agency either. You don’t ever want to be in a situation where you get into a client’s residence or commercial property only to learn that you don’t have the right pieces to fit. Stonexchange can offer fabulous, below-market pricing on bulk orders of natural stone thresholds because we are the source of material as well as the fabricator and importer. Although our inventory contains only standard sizes on all the popular styles of marble thresholds, fabricating custom-size product is also our specialty. Remember, these floor saddles are relatively inexpensive because we own the raw material, not because we are offering an inferior stone product. Whatever size threshold you need for your construction or remodeling project, contact us for the best deal you will find anywhere. Stonexchange proudly offers the finest marble thresholds in the industry. Saving money and getting exactly what you need is our promise to you. Contact us today and speak to one of our skilled representatives to learn more about all the exciting options available for your construction site.